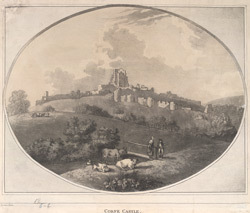 Oval view of the ruins of Corfe Castle in Dorset. A castle was built here by William the Conqueror but the castle seen here was built later and in stages. It has a Norman keep and system of walls with bastions around the inner and outer bailey. Its position is on a steep hill on the Purbeck Ridge. The castle was built of local Purbeck stone, which was considered the highest quality limestone in England. It was a royal castle for centuries although by the late 18th century it was owned by the Bankes family. It was severely damaged in the Civil War during several sieges by the Parliamentary army, which led to its ruinous state.